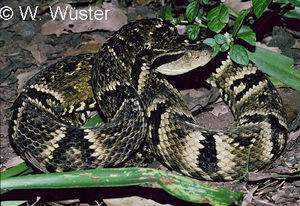 Medium to moderately large in length, slender bodied pitviper. Can grow to a maximum of about 1.60 metres. Head is broad, flattened, lance shaped when viewed from above and distinct from narrow neck. Snout is not elevated. Eyes are medium in size with vertically elliptical pupils. Dorsal scales weakly keeled. Tropical deciduous forest, semitropical upland forest and savanna including open regions in cultivated areas near vegetation cover. Terrestrial and mainly a nocturnal snake. Will climb into low vegetation in search of prey. Adults feed mainly on rodents and birds and juveniles feed mainly on frogs, centipedes and small birds. Female ( n=12 ) = 185 mg, Newborn = 38 mg. Furtado et al (1991) ( Ref : R000651 ). Minas Gerais, Brazil : 51 mg ( dry weight ) ( range 27 to 103 ), Sanchez et al (1992) ( Ref : R000690 ). Argentina : 98.0 ± 16 mg ( dry weight ) = 38.3 ± 6.19 mg venom / 100 g body weight, De Roodt et al (1988) ( Ref : R000870 ). 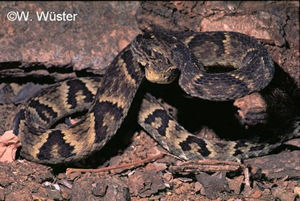 Description: First aid for bites by Viperid snakes likely to cause significant local injury at the bite site (see listing in Comments section). This treatment advice is general for most Bothrops species. Bites will vary from minor to life threatening. Therefore manage all bites as potentially major. Look for moderate to severe local effects, including pain, swelling, potential for fluid shifts and hypovolaemic shock, blistering, necrosis, abscess formation. Systemic effects may be minor or severe, possibly including coagulopathy and bleeding, kidney damage, even myolytic muscle damage. 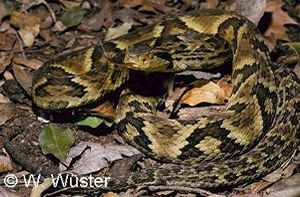 All cases with significant systemic effects require IV antivenom, as will most cases with significant local effects.